Springtime means playtime. Kids are getting antsy and playing outside, and when they’re running around they reach for snacks. We all know how important it is for kids to get the nutrition they need to grow big and strong. In honor of springtime we’re providing you a refreshing recipe for your little ones. Between birth and the age of five it’s important for children to consume adequate amounts of DHA omega-3 fatty acid to support this period of rapid brain and eye growth and development. On average, U.S. children consume only 30 to 50mg of DHA per day, but expert bodies recommended they receive 700-900mg of DHA per day to assist with brain and eye development, and cognitive function. One reason why kids don’t consume enough DHA on a regular basis is because foods that naturally contain DHA, like salmon and other fatty fish, are not usually part of kid-friendly meals. 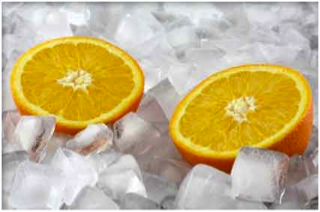 For a sweet, refreshing treat, try this Orange Frosty with DHA. Place all ingredients except relish in blender. Cover and blend on high speed 30 seconds, or until smooth. Pour into five 6-ounce glasses and top with a teaspoon of relish. Serve immediately. Makes five 6-ounce servings. Place fresh cranberries in ice cube trays, fill with water, and freeze. Once frozen, pop out the ice cube and put two or three in glass before filling with Orange Frosty to make a pretty, festive drink. Recipe provided by Elizabeth Somer, M.A., a registered dietician. Comment below and let us know how you feed your kids the DHA they need. Next Post How Healthy Is Your Brain?